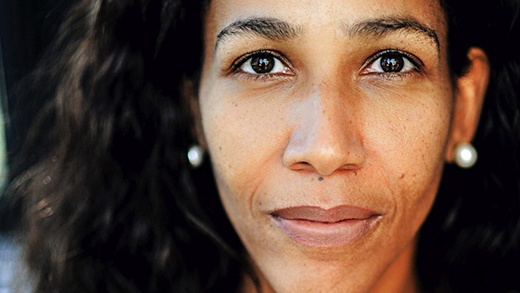 The child of a German mother and Nigerian father, author Jennifer Teege visits Emory on Monday to discuss her powerful memoir, "My Grandfather Would Have Shot Me," about discovering her link to a brutal Nazi leader. Jennifer Teege's decision to open a book that caught her eye in the Hamburg library eight years ago unearthed an improbable truth for a half-Nigerian, half-German woman: Her grandfather was a Nazi. Amon Goeth was not just any Nazi. He was the sadistic kommandant of the Plaszow concentration camp in occupied Poland made infamous in the film "Schindler's List." Teege recounted her tumultuous journey coping with the revelation in her memoir, "My Grandfather Would Have Shot Me." She will share her experiences Monday, Jan. 25, in the Oxford Road Presentation Room. The free event begins at 4:30 p.m. and is open to the public. "She speaks Hebrew. She watched 'Schindler's List' with friends in Israel," says Peter Höyng, the professor of German Studies who helped coordinate Teege's Emory talk. "All that time, she was clueless about this linkage to Amon Goeth." Teege unravels her story based on the age-old theme of whether nature or nurture is the deciding factor that creates who we are. She leans toward upbringing and education, for both herself and her grandfather. The latter, Hönyng says, "is stunning to hear her explain." Teege's story starts with discovering the memoir "I Have To Love My Father, Don't I" in that public library when she was 38. Her birth mother, whom she had regular contact with until she was adopted when she 7, had written it in 2002 without telling her about her lineage. Teege's book focuses as much on her grandfather as it does her grandmother, Goeth's wartime lover who continued to deny he committed atrocities even after he was executed for war crimes in 1946. She also recounts visits with Israeli schoolchildren to Plaszow and Krakow, where Goeth brutally liquidated the Jewish ghetto. Emory College students in German 202 are studying excerpts from the book in its original language but find a Hebrew word in the final lines. Upon laying a wreath for those lost at Krakow, Teege and the children sing the Israeli national anthem, "HaTikva," or "The Hope." In recognition of that broad appeal, Teege's appearance is co-sponsored by the Hightower Endowment, which memorializes the late Robert E. Hightower by helping to bring outstanding visiting lecturers to Emory, as well as the Waxman Support Fund of the Tam Institute for Jewish Studies, the James Weldon Johnson Institute for the Study of Race and Difference and others. "It's her attempt to turn this story into a positive experience that compels her and us to share it with the larger community," says Hiram Maxim, German Studies chair.